The iOS is one of the two most popular mobile operating systems on the market, alongside Android OS, so it does not come as a surprise most renowned gambling operators in the industry are committed to developing mobile applications that are running seamlessly on this widespread platform. 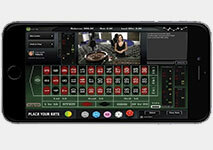 There is hardly a self-respecting interactive casino which does not offer mobile play to iPad and iPhone users. Furthermore, all leading software suppliers have adapted the most preferred titles in their collections for mobile play, so the games can be loaded via iOS devices in no time. Mobile casinos consider the needs of all players which is why, apart from the numerous iOS slots, gambling enthusiasts will be able to engage in various roulette games while on the move. Gambling operators truly go the extra mile to satisfy the appetites of the most demanding fans of this game of chance, offering them mobile roulette variations which impress with spectacular graphics, immersive sounds, and easy-to-navigate interface. If you enjoy roulette but are new to the whole iOS-gaming experience, we suggest you take a quick look at the following article to find out more about how the game is played on iPhones and iPads. 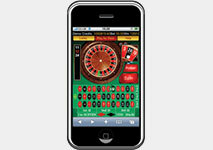 We also provide Apple users with brief overviews of five of the best mobile casinos offering iOS roulette. Several years ago, iOS casino players had a limited number of options to choose from but this is no longer the case. Portable devices like iPhones and iPads have gone a long way since then – their available memory space has increased greatly while the processing speed and the graphics’ quality have improved tremendously. Today, Apple users interested in making a few real-money roulette bets from the comfort of their surroundings can generally choose from two possible options – registering at a mobile-responsive casino or downloading the iPhone app of their preferred gambling operator, if available. Which option you go for generally depends on your individual preferences and the mobile casino of your choice. In-browser play can sometimes be problematic for iPhone owners due to the fact the operating system the devices run on does not support the widespread Flash plug-in, which is used to load different types of multimedia like videos, interactive games, animations, and music. Because of this, players may find themselves unable to load their favorite roulette variations directly in their iOS devices’ browsers since some mobile casinos require an up-to-date Adobe Flash Player to run their games smoothly. There is a silver lining though since the popularity of Flash is slowly waning because this technology has become less reliable. Flash has been designed with the needs of desktop and laptop users in mind, which is why some mobile players report poor user experience on their touch-based devices. The good news for roulette fans who own iPhones is that the popularity of the HTML5 mark-up language is currently on the increase, with more and more mobile casinos adopting it for their websites. The latest version of the HTML5 language boasts a broader support for video and graphics content. Thus, iPhone users will be able to load their preferred roulette game directly in their browsers as long as the mobile casino supports the universal HTML5. Needless to say, having a reliable 4G, 3G or WiFi connection is recommended if you do not want to experience any lags and freezes while playing roulette on the go. Many players prefer to download and install the casino’s native iOS application on their iPhones or iPads, provided one such app is available (and it usually is). A good number of established gaming providers offer iOS applications for a free download. Players interested in installing the iPhone apps can visit the App Store and input the name of their casino in the search engine. Another convenient option is to simply visit the casino’s website and download the application directly from there. Some minimum system requirements need to be met, however, since most casino apps run on iOS 6.0 or above. Having sufficient memory space on your smartphone or tablet is also a necessary requirement, but in most cases, the casinos’ iOS apps rarely exceed 50 MB in size. If you have ever played roulette on your laptop or desktop computer, you will hardly experience any issues in finding your way around when you load the game on your iPhone. The truth of the matter is the biggest difference results from the enhanced convenience and flexibility mobile gaming can offer. Provided that you have already opened a real-money account with a given online gambling operator, you will not be required to register again to play on the go – you can easily sign in with your existing desktop username and password. However, new customers of the mobile casinos will have to go through a quick registration process and input some of their personal and financial information in the registration form, including their email, address, phone number, and date of birth. There is no need to stress over the safety of your details – established mobile casinos have adopted the latest encryptions to protect their patrons from identity thefts and frauds. Once you have registered and boosted the balance of your account, you will be able to play roulette on your iOS device for real money with a few taps on the screen only. The mobile interface of the game is a bit different than that on desktop devices in order to accommodate the specifics of iPhones and iPads as well as their smaller screens. For instance, you may notice it is impossible to see the table’s betting layout and the roulette wheel all at the same time simply because the two cannot fit on the screen simultaneously. Placing one’s roulette bet on iOS devices is exceptionally simplified. What you need to do first is select your preferred coin denomination – the available coin values are displayed either on one side of the betting layout or directly below. Once ready with that, you should simply tap on the betting box corresponding to the type of bet you wish to make and then touch the spin button. With some mobile variants of the game, players need to swipe across the screen with their finger in order to set the little ball in motion. When the ball comes to rest, the amount you have won will be shown on the screen. Popular iOS variations of roulette come with a number of useful and helpful functionalities. Players can keep track of the games’ history as the results on previous rounds are usually displayed on the screen. It is possible to zoom the betting layout for a closer look either by tapping it twice or by sliding your thumb and index finger apart. If you feel you have entered a hot streak, you can let it roll without having to tap the screen at the end of each round since many iOS-compatible roulette variations come with an Autoplay (sometimes called “Quick Bet”) functionality which is typically activated by holding the spin button for a while. Another useful feature iPhone roulette players will benefit from is the Re-Bet functionality but it all depends on the software supplier the game is courtesy of. Before you start playing on you iPhone, however, make sure you rotate the screen horizontally, in landscape mode. You will be amazed at how bright and crisp the graphics and animations are, which is to be explained with the higher pixel density of the iPhones and iPads’ screens. This would render your gaming experience even more authentic and enjoyable. Players interested in playing roulette on their iPads or iPhones are recommended to stick only to reputable online gambling websites. There are literally hundreds upon hundreds casinos on the web but unfortunately not all of them are created equal, with some being more reliable than others. If you are a fan of roulette but still have not found an established iOS mobile casino to play your favorite game at, we strongly recommend you to take a look at the five renowned gambling operators we have reviewed below. Guts is a top instant-play interactive casino which utilizes software by some of the greatest innovators in the industry, including big names like NetEnt, Betsoft, and Microgaming. The casino caters to the needs of players the world over, offering them an extensive gaming library and an easy-to-navigate website, which supports multiple languages, including Norwegian, Swedish, English, and Finnish, among others. The comprehensive portfolio spans various well-known slots like Gonzo’s Quest and Starburst, video poker and of course, a nice list of traditional table games. Those, who own an iPhone or an iPad will be able to make a pick from several authentic roulette variants, including the classic European and American variations of the game. These are fully optimized to run on iOS, but Android users will also be able to play them on the go. Guts Casino does not offer a native iOS app at the moment but this is hardly a big omission since players will be able to load the games directly in their mobile browsers. Players can also take a seat at one of the live dealer tables and join the friendly croupiers for a game of French or Immersive Roulette. Customer support is available throughout the day via the convenient live chat facility. Those who open an account at Guts Casino should also brace themselves up for a wealth of appealing promotional offers, starting with a hefty Welcome Bonus of £300 plus 100 free spins on selected slots. The website operates under licenses, granted by the UK Gambling Commission and the Malta Gaming Authority. Casino Action is an established brand which operates as part of the well-known Casino Rewards Group. The website is powered by one of the biggest software providers in the world, Microgaming, which ensures players will benefit from a shockingly diverse games selection, available in instant play or via the casino’s free downloadable client. Roulette fans will be able to take their favorite game wherever they go as Casino Action is compatible with portable devices based on iOS, Android, and Windows Phone OS. Players can access the casino’s lobby in their browsers without having to install any additional software. But these are not the only advantages of joining the gaming community at Casino Action. The latter is home to numerous promotional incentives, starting with the sum of £1,250 in Welcome Bonuses upon your first five deposits. All personal information and financial transactions remain confidential and are carried out in compliance with the strictest security standards in the industry. Non-English speakers will be able to load the casino’s website in different languages, such as Swedish and German. Golden Tiger is yet another trusted online casino that is part of the prestigious Casino Rewards Group. Players who register there should definitely prepare themselves for an exhilarating experience as there is a huge range of bespoke Microgaming games to choose from, including a wealth of modern slots, video poker, blackjack, and roulette variations. Golden Tiger keeps up to date with the latest trends in the online gambling industry, which is why it was adapted for mobile play on the commonly used iPads and iPhones. The website also loads seamlessly on Windows Phone, Blackberry, and Android-based devices. Some of the options available for mobile play include European roulette, blackjack, and video poker like the popular Jacks or Better variation. New members of Golden Tiger Casino are greeted with the generous sum of £1,500 in Welcome Bonuses when they process their first five deposits at the website. Speaking of deposits, there are plenty of reliable options you can choose from to boost your balance, with the most popular options being Visa, MasterCard, Neteller, Paysafecard, and PayPal. Meanwhile, Golden Tiger Casino enjoys an excellent reputation for its hassle-free, fair, and very fast withdrawals. Should you need any assistance or additional information, do not hesitate to get in touch with the well-mannered representatives of the casino’s support – they are ready and willing to assist players via the live chat functionality at all times. A veteran in the online gambling industry, bet365 was launched back in 2001 but has greatly expanded today as it has added a virtual sportsbook, bingo and poker rooms to its list of offerings. Apart from the virtual casino where players can engage in a plethora of enticing slots and traditional table games, there is also the option to taste what the real casino floor’s ambiance feels like since bet365 is home to a live dealer offering as well. Furthermore, the glitz and glamor of Las Vegas are a single tap away since the website is mobile responsive and also offers native apps for iOS and Android for a free download. The Apple applications are known to run seamlessly on iOS8, iOS9, and iOS10 and provide roulette fans with the chance to indulge in classic games like Premium Roulette. Both new and existing members of the casino are showered with bonuses and can partake in a range of appetizing promotional incentives to extend the duration of their gaming sessions and boost their balance. The casino supports an impressive number of currencies and is available in just as many languages, which furthers the convenience of players from different countries around the world. Efficient and courteous customer support is offered at all times via a live chat facility, email, and telephone. Intertops is one of the biggest names on the interactive gambling scene and as such, is frequently associated with fair play, safety, and quality. Indeed, this is what players who register real-money accounts there will get as the casino processes payments via the most secure and dependable banking methods out there, offers time-efficient payouts, and runs on software that is courtesy of RealTime Gaming and NextGen. A live dealer casino and a virtual poker room are also available at players’ disposal. Some of the games on offer, like Pay Dirt and Mega-Money Mine, truly are life-changers as they provide lucky players with the opportunity to scoop giant progressive jackpots. The portfolio can be loaded in instant play but installing the downloadable client on your desktop computer is also an option. Gaming on the go is also possible since Intertops Casino boasts a website that is fully compatible with iOS, Android, and Windows Phone devices. The mobile interface is easy user-friendly and easy to navigate, with players being able to contact customer support, process payments, and partake in promotions as they go. Roulette enthusiasts, in particular, can indulge much to their hearts’ content in the mobile variant of European Roulette.